School Atlas | 1847 Germany, Switzerland, N. Italy. | Historic Antique Vintage Map Reprint by historic pictoric at KBFS. MPN: 563558_2432. Hurry! Limited time offer. Offer valid only while supplies last. Map of Germany, Switzerland, and Northern Italy. Engraved to illustrate Mitchell's school and family geography. J.H. Young Sc. 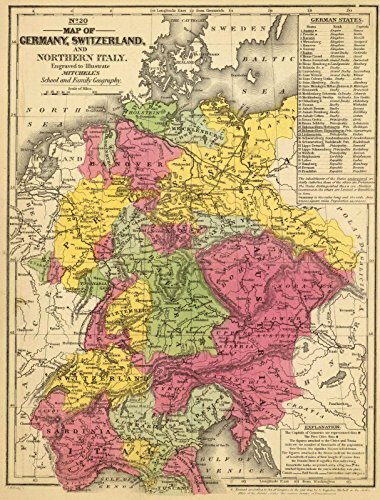 Entered ... 1840 by S.
Map of Germany, Switzerland, and Northern Italy. Engraved to illustrate Mitchell's school and family geography. J.H. Young Sc. Entered ... 1840 by S. Augustus Mitchell ... Eastern District of Pennsylvania.|Mitchell's school atlas: comprising the maps, etc., designed to illustrate Mitchell's school and family geography. Philadelphia: Thomas, Cowperthwait & Co., 1847. (on cover) Second revised edition.